NOTSUITABLE FOR OLD PEOPLE OR CHILREN OR PATS. There is not a perfect timing for Pamukkale, any season you may enjoy the place. In winter, it might be attractive to swim in the hot spring pools or in summer you may cool yourself among the ancient ruins at the Cleopatra pool. The avarage sea temprature is 33 C in summer. Property is located just outside the resort of Kusadasi, which can be reached by a 10 minute Dolmus ride. There are a few resturants and shops locally along the beach front, but the main nightlife is found in the center of Kusadasi. Here you will find numerous nightclubs/disco bars and resturants . Many restaurants will offer to collect you from the villa and return you when you have finished for the night(free of charge). 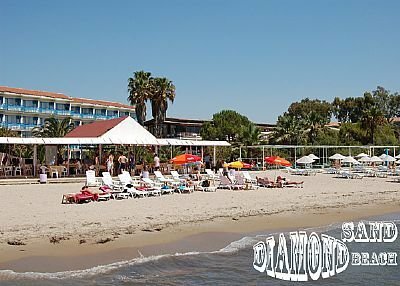 The Silver Sand Beach is much larger than the beaches which you will find in Kusadasi, where you will find a man made beach in the center and a very small crowded beach called Ladies beach, so this villa is perfect for those who like a nice quiet beach that stretches for miles but still close to all the main entertainment . This villa is perfect for having a lazy day by the pool or soaking up the sun on the huge roof terrace and can be finished off with a barbeque and then relaxing in your own balcony in your bedroom before you retire to bed.